Who was Powhatan and why was this Native Indian chief famous? Summary: The Powhatan Confederacy was founded in 1580 by Wahunsonacock who became commonly known as Powhatan. He was the father of Pocahontas who famously saved Captain John Smith. He was a leader during the Powhatan Wars (1609 - 1646) that were fought during the early colonization period between the English settlers of the Virginia Colony and the Algonquian-speaking tribes in the Powhatan Confederacy. The following fact sheet contains interesting facts, background history and information about the life of Powhatan, aka Wahunsonacock, and the events in history that led to his fame as a great Native American Indian leader and founder of the Powhatan Confederacy in 1580, which consisted of 30 tribes. The Powhatan tribe, also spelled as Powatan and Powhaten, inhabited in Virginia in the early 17th century. They conversed in an Algonquian language. The tradition of crowning a Native Indian chief as a king started in 1608 when Chief Powhatan, the father of Pocahontas, was crowned as a king. The conflict started when the English arrived under the leadership of Captain Christopher Newport. Chief Powhatan sent out an ambassador to the English to bring peace. Powhatan even sent food to American every year after the harvest season so the new settlers could survive. The good relations floundered as the colonists demanded too much food and land. Native towns were burnt if their demands were not met. Colonists also began to capture Powhatan warriors and so the conflict began. In 1607, Captain John Smith was captured and was about to be beheaded but Pocahontas saved his life by placing her head instead. He was released the year after his capture; however, he was sent back to the tribe to negotiate with Powhatan. Powhatan agreed with their negotiation and continued to supply food to the English settlers. The Americans became too demanding which angered Powhatan. In 1609 tensions between the Native Indians and colonists increased when livestock, owned by the colonists, were allowed to wander into the Indian cornfields. The tribe reduced trade attempting to starve the colonists out. The chief invited the English to his new place to trade but instead of trading his tribe attacked the English and many were killed. The chief commanded the federation to refuse any trading with the English and attack any English who left Jamestown. Attacks were made on the fort and the First Powhatan War (1609 - 1614) erupts. The period covering the next 2 years (1609-1610) would become known as the 'Starving Time'. In 1613, Pocahontas was captured so the English settlers could increase their demands from Powhatan. Powhatan needed to secure the release of his daughter so he met with the English in the fort and brought with him the guns that they had taken from the other English settlers. Unfortunately, the chief and his tribe did not meet all the demands of the English so Pocahontas remained their captive. In April 1614 Pocahontas married English tobacco planter John Rolfe and peace returned to the warring factions. The first war (1609 - 1614) was over. The union between Pocahontas and John Rolfe brought peace to both groups. It lasted for the rest of the Powhatan’s life. 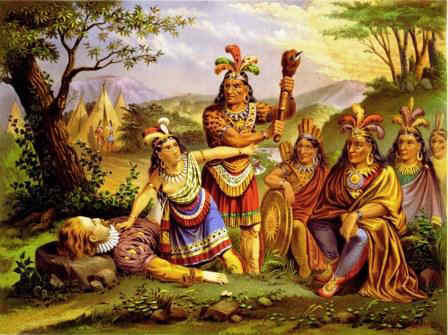 Pocahontas died in 1617 and the death of Chief Powhatan followed a year later in April 1618. His brother Opechancanough, succeeded his leadership to the Powhatan Federation of Indians. Another conflict had started under his leadership and the wars between the colonists and Native Indians started again. "Why should you take by force that from us that which you can have by Love? Why should you destroy us, who have provided you with food What can you get by war?" "I am not so simple as to not know it is better to eat good meat, lie well, and sleep quietly with my women and children; to laugh and be merry with the English; and being their friend, to have copper, hatchets, and whatever else I want, than to fly from all, to lie cold in the woods, and to be so hunted, that I cannot rest, eat, or sleep." The Powhatan Wars (1609 - 1646) were a series of three wars between the English settlers of the Virginia Colony, and Native American Indians of the Powhatan Confederacy. The First War was fought 1609 to 1614. The Second War was fought 1622 to 1632.